Amanda Seyfried & Lily James World Premiere 'Mamma Mia! Here We Go Again' in London! Lily James and Amanda Seyfried happily hit the blue carpet together while attending the world premiere of their anticipated film Mamma Mia! Here We Go Again held at the Eventim Apollo on Monday (July 16) in London, England. The two leading ladies were joined at the event by their co-stars Dominic Cooper, Jeremy Irvine, Hugh Skinner, Josh Dylan, Jessica Keenan Wynn and Alexa Davies. Also in attendance to show their support was Amanda‘s husband Thomas Sadoski, as well as Lily‘s boyfriend Matt Smith, who didn’t hit the carpet but was spotted making his way inside the premiere separately. FYI: Lily is wearing Oscar de la Renta. 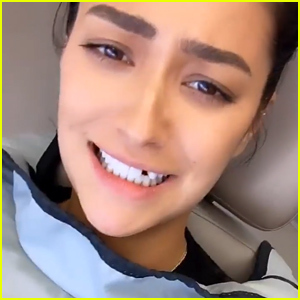 Amanda is wearing Tiffany and Co. jewels. 'Mamma Mia' Sequel Poster Features the Entire Star-Studded Cast! Mamma Mia! Here We Go Again, the sequel to the hit film, has debuted a brand new poster featuring the full cast! 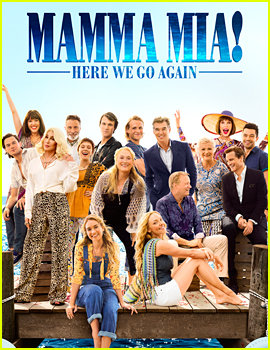 On the poster, you can see Meryl Streep as Donna, Julie Walters as Rosie, Christine Baranski as Tanya, Amanda Seyfried as Sophie, Dominic Cooper as Sky, and Pierce Brosnan, Stellan Skarsgård and Colin Firth as Sophie’s three possible dads: Sam, Bill and Harry. In addition, Lily James, Josh Dylan, Hugh Skinner, Jeremy Irvine, Alexa Davies, Jessica Keenan Wynn, Andy Garcia and Cher are new to the cast in roles that go back and forth in time to show how the relationships between characters were forged. Look out for the movie, in theaters on July 20! 'Mamma Mia! Here We Go Again' Trailer: Sophie is Pregnant, Donna is Dead(?! ), Cher is Grandma! 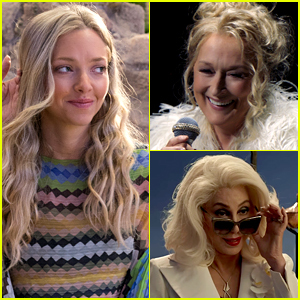 The trailer for the upcoming movie musical Mamma Mia! Here We Go Again has arrived and it reveals some shocking plot developments! As the trailer starts, we find out that Amanda Seyfried‘s character Sophie is pregnant and that Meryl Streep‘s character Donna has seemingly died. Sophie welcomes her aunties Tonya (Christine Baranski) and Rosie (Julie Walters) to help her prepare for the baby and they tell her about what Donna was like as a young woman. Enter, Lily James as young Donna! Pierce Brosnan, Stellan Skarsgard, and Colin Firth return to play Sophie’s three possible dads: Sam, Bill and Harry. Dominic Cooper is also back as Sky! 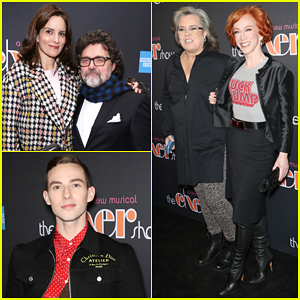 Joining the cast are Cher as Sophie’s grandma, Alexa Davies as young Rosie, Jessica Keenan Wynn as young Tonya, Jeremy Irvine as young Sam, Josh Dylan as young Bill, and Hugh Skinner as young Harry. Mamma Mia: Here We Go Again hits theaters on July 20, 2018.